Meet Jerry the Bear! Jerry's no ordinary teddy bear, though; he's designed to teach children the fundamentals of a healthy lifestyle. As children interact with and care for Jerry, they learn how to take care of themselves as well. 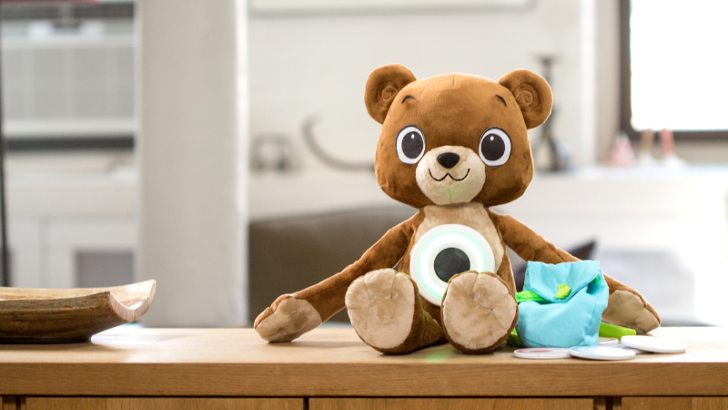 Jerry the Bear is designed by Sproutel, a smart toy and health technology development company, and he's available in three modes targeted at different child health issues: health & wellness, type 1 diabetes and food allergies. Pre-orders are now available for this breakthrough educational toy—read on for details! Children interact with Jerry through the electronic portal on his belly. They can “see” into Jerry’s emotional and health needs and respond as appropriate, helping them build healthy habits from an early age. Core lessons include identifying feelings, healthy eating and brushing teeth. Jerry is Internet connected and will update to grow with his carer and as new product features are developed. Jerry is particularly designed for children ages 4 to 9 years, but children up to 14 years-old have loved playing with him too. Jerry the Bear is now available for pre-order to help gauge production requirements. Delivery is anticipated in June 2016. The basic health & wellness model is $99, and the diabetes and food allergy models are $149 each. Sproutel has pledged 1% of sales of the health & wellness model to help fight obesity and hunger through the Food Research and Action Center. The diabetes and food allergy expansion packs will support finding cures through the Juvenile Diabetes Research Foundation and Food Allergy Research and Education. Jerry the Bear has been developed after extensive prototyping and consultation with families and healthcare professionals. 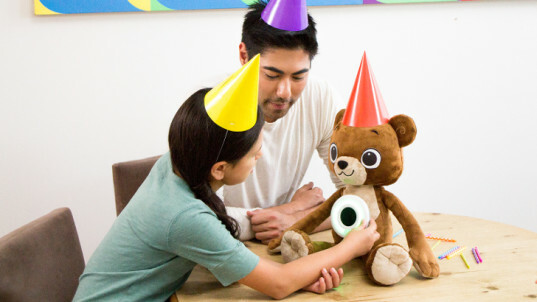 An earlier model was the first ever smart companion for children with type 1 diabetes, and was distributed to 4% of children who were newly diagnosed with the disease in 2014, as well as 25% of pediatric endocrinologist offices in the U.S.
Sproutel is expanding their product line to bring super fun, medical­-grade education to all children. Aaron Horowitz, co-founder of Sproutel, says, "Our goal is to leverage the power of play to help children live happy and healthy lives." Children interact with Jerry through the electronic portal on his belly. They can "see" into Jerry's emotional and health needs and respond as appropriate, helping them build healthy habits from an early age. Core lessons include identifying feelings, healthy eating and brushing teeth. Jerry is Internet connected and will update to grow with his carer and as new product features are developed. Jerry is particularly designed for children ages 4 to 9 years, but children up to 14 years-old have loved playing with him too. Jerry the Bear is now available for pre-order to help gauge production requirements. Delivery is anticipated in June 2016. The basic health & wellness model is $99, and the diabetes and food allergy models are $149 each. Sproutel has pledged 1% of sales of the health & wellness model to help fight obesity and hunger through the Food Research and Action Center. The diabetes and food allergy expansion packs will support finding cures through the Juvenile Diabetes Research Foundation and Food Allergy Research and Education.